This year the tour lived up to is ability to produce shocking "results" and newsworthy stories on top of some incredible racing, both on the flats and in the mountains. It was the closest GC finish in history, and the top three cyclists in the points competition were each just one win away from taking the maillot vert. Alberto Contador has been pegged as the next great hope, a 24 year-old phenom who can both climb and time trial, but perhaps the new hope lies with cycling itself. Finally the administrators appear to be taking a long-range view of the doping situation, showing courage and fearlessness in expelling two top riders. Will this hurt cycling? In the short term, yes, the sport will likely take a knock, but this bodes well for the future of the sport. In additon, one of the tour officials expressed his hope at the riders' silent protest at the start of Stage 16. In the past, this official said, the riders would protest the doping controls, opposing their invasive nature and in fact their even existence. Now the peleton is protesting against the dopers, and surely this must be a sign of hope for anyone. Thanks for tuning in to our tour analysis. Come back for a bit more post-tour wrap up and analysis before we leave cycling behind and shift to ultra-endurance exercise and, of course, the IAAF World Champs which start in Osaka on 25 August. Success at cycling in the mountains: Apart from drugs, what does it take? I guess the title of this post is hypothetical, because from the developments over the last week and a half, it seems that prerequisite number one is to have the right pharmaceutical support. But we will attempt to refrain from further jabs at the sport. However, as I write this, at 10:21 on Saturday morning, the word coming out of France is that another prominent rider has tested positive, and there is speculation that it is a Barloworld rider - any bets for Soler Hernandez? So this might be one of our more hollow posts, but we thought we'd have a look at the PHYSIOLOGICAL characteristics of elite cyclists, based on testing that has been carried out over the last 10 years. Obviously, the requirements are dependent on the type of rider and the type of stage being ridden. Tom Boonen, then, is a very different rider to Alberto Contador, and a time-trial requires a very different "skill-set" to a mountain climb. So the table below shows some of the requirements of flat stages, mountain finishes and Time-Trials. This is adapted from a research paper from Lucia et al. (2003). Climbing success is all about power to weight ratios. In order to climb at the front of the peloton, the required power output is approximately 6W/kg. Therefore, a 60kg likeweight needs to be able to produce a power output of 360W for upwards of 45 minutes, whereas a slightly heavier rider weighing in at 75kg must maintain 450W for this time. It's easy to see then, why guys like Pantani, Hamilton and even Armstrong (post-cancer) were more successful in the mountains, and also why Ullrich, who famously struggled with his weight between Tours, would face such an uphill (excuse the pun) battle during the Alps and Pyrenees of the Tour. This is an 18% improvement, which is massive. It means that Armstrong's change in body mass and slight increase in power output add up to a huge increase in climbing performance. The other contributor to this change, by the way, is increased cycling efficiency, because when cycling at the SAME VO2, Armstrong was able to produce a greater power output, and that's important for a number of other reasons, one of which we'll get to in a moment. So, all the top climbers in the Tour de France are able to ride at about 6 W/kg for 45 minutes at a time. This obviously does not account for the ability to accelerate and open gaps on competitors, which would require power outputs of 8 to 10 W/kg for a short time! So an attack might see a rider lift the power output up to 600 to 800W for a short time, then settle back into a level that they can sustain for the next 45 minutes! Another factor that gets a lot of air-time is VO2max. Basically, this refers to the volume of oxygen that the athlete can use at maximum effort or exhaustion. Personally, we don't think it's all that vital - just have a look at the paper of Lucia (Med Sci Sports Exerc, 2002) which showed that the best cyclists did not necessarily have the highest VO2max values. Of course, if you are going to be a world-class cyclist, its almost a given that you have to have a high ability to use oxygen, but once you get there, then it becomes a little different. In otherwords, a world class athlete will have a VO2 max of anything between 70 and 90ml O2/kg/min. But the guy with 90 is not necessarily better than the guy with 70! Why is this? Two reasons. The first is that cyclists in the Tour are not riding at VO2max when they compete anyway - they are, as the table shows, only at about 80 to 90%. Therefore, it is not "top-speed" that counts, but economy at submaximal intensity. A rider who is economical will be able to ride at 80% of his VO2 for longer than a rider who is not, and so VO2max becomes less important. Lucia showed it in that paper from MSSE (2002) , where he found that the guys with the high VO2 tended to have a lower cycling efficiencies. Looked at the other way around, a cyclist with a lower VO2 will have a higher efficiency of cycling. What does this mean? Well, cycling is an efficient activity, but it's far from perfect. Remember your high school science when you may have learned about steam trains and the fact that a lot of energy from the coal gets lost as heat. Similar to cycling. So a cyclist is actually doing a lot more work than what actually goes into moving him and his bike forward. Generally, people will have efficiencies of between 15 and 25%. This means that only 20% of the energy you put in actually contributes useful work. The implications of this are enormous - it means that a cyclist who is 20% efficient might be riding at 400 W, but he's actually producing 2000 W of work (20% of 2000W is 400W). Now, if this same cyclist could increase efficiency by just 1%, then he would be able to ride at the same power output of 2000 W, but his USEFUL work would jump up to 420 W (21% of 2000W). This 20W difference is, as I'm sure you can imagine, massive. So the take-home message of all this is that it's not so much what the rider can do at MAX, but how efficient he/she is at sub-maximal levels, and this involved efficiency. Obviously, there are many more factors that have to be present to allow elite cyclists to ride the way they do - ability to use fat as energy, metabolism, ability to clear lactate, lung volumes, heart function etc. But that is a book, not a blog post, which we can perhaps get to some day! For now, though, the key is the ability to sustain a high power output for long periods, and to ride with maximum possible efficiency! With North American summer in full swing and the cycling season at its peak with Le Tour finishing up, we thought we would stay focused on cycling, but take a different look at the science behind it. Epidemiology is the study of the factors affecting the health and illness of a population or populations. These scientists gather massive samples (thousands to hundreds of thousands of people) and look the different rates of incidence of whatever they are interested in. When you read statistics in articles that say your chances are "3.4 times higher" for getting a disease, or the number of people with an illness is "23 per 1000 people," we have the epidemiologists for working these out for us. In Exercise Physiology, we are often interested in the rates of injuries in certain sporting populations, and how much greater the risk is for certain injuries between sports. Dr. Lara Dugas is an Epidemiologist at Loyola University and a cycling fan (and Jonathan's wife! ), and she brought this study about traumatic brain injuries to our attention. You can read the article to learn how they collected the data, but the take home message is that traumatic brain injuries (TBI's) from cycling account for only 7.7% of the total number of injuries sustained from that sport. So there were nearly 525,000 cycling injuries reported in this study, and about 40,000 were TBI's. When we compare this to playing on the playground, for example, the incidence of brain injuries is very similar (7.1%). Therefore we can conclude that whether you injure yourself on the playground or on the bike, the chances that your injury is a TBI is similar between the two activities. In addition, 5-18 year olds account for 59% of all cycling injuries, and this age group also accounts for 57% of all TBI's in cycling. So adults are at lower risk for TBI's then those under the age of 18. And the higher risk sports, you ask? Well, TBI's in horseback riding make up 11.7% of the total injuries from that sport, and TBI's make up 10.4% of the injuries sustained during ice skating. All the other 25+ activities fall in the 1-6% range, with TBI's in Track and Field making up only 1.8% of the total number of injuries sustained during that particular activity. Of course we all know that wearing a helmet while cycling---even when just cycling to the store down the road---greatly reduces your risk of any kind of head injury. Having said that, it is amazing that the state of Illinois (and probably many others in America) do not have any kind of helmet laws for bicyclists or motorcyclists, although for races sanctioned by USA Cycling helmets are obligatory. Previously the UCI allowed professionals to remove their helmet on the last climb of the day if it were a mountain top finish, and also their time-trial helmets did not have to actually be a helmet----instead they were just an aerodynamic foil with no protection in them! Fortunately in recent years the UCI has introduced rule changes that require professional riders to wear their helmets for the entire duration of a race, which ultimately has a large "impact" on their health and influences the behaviour of amateur cyclists everywhere. Enjoy the time trial on Saturday, and don't forget to vote in new poll! These are radical times for the Tour de France and professional cycling. Michael Rasmussen, the wearer of the yellow jersey, celebrated yesterday for a great ride that saw him fend off Discovery's attacks on the Col d'Aubisque, has been dumped off his team and the Tour after it was revealed that he had lied to the team management after his whereabouts during the month leading up to the race. "Trust me", were his words, spoken two days ago at a press conference when questioned about a growing perception and discontent among cycling experts about his doping-status. First it had been revealed that four warnings had been issued by the UCI and Danish Cycling Federation after he failed to inform them of his location. Then a former mountain-biking pro came forward with allegations of how Rasmussen tricked him into carrying an illegal doping product in Europe in 2002. You can see this article and a great commentary on it here and here. So Rabobank made the decision to sack Rasmussen and expel him from the Tour based on the fact that he had lied to them about his whereabouts. Think about this for a moment...This is the same cyclist who the Tour organizers have tested 14 times during the course of the race. Not one test was positive. The message being delivered by Rabobank is that the testing is insufficient, and the sponsors are now beginning to take executive decisions to kick out riders, based on allegations and suspect behaviour. There was a time, not long ago, when a sponsor would stand by its lead cyclist, supporting their claims that they were clean, had never been tested positive, and so on. How the sport has changed! Some will decry this as a witch-hunt, and rider's rights will be thrust into the forefront in a debate that is sure to have far-reaching ramifications. Personally, I say more speed to this attitude, because it's clear that the sport is in serious trouble, and drastic times call for drastic measures. And if the riders and the sport will not clean up, then the sponsors can. And more than this, the testing procedures are weak, let's face it. In the case of the Rasmussen-Richards doping allegation, the product that Richards was alleged to have transported into Europe was Hemopure, a member of an exotic class of medicines known as hemoglobin-based oxygen carriers, or HBOCs, for short. Hemopure is legal in South Africa ONLY. It was only commercially available in SA beginning in January 2006 and it is still not approved for human use in any other country, although an analog, called Oxyglobin, is approved in several countries, including the United States, for veterinary use. Do tests even exist for this? How do athletes get hold of products that are not commercially available and not even passed for human use? And what is the tester to do? In athletics, the BALCO scandal and the discovery of a designer steroid (THG) showed that laboratories all over the world, given enough incentive, can produce drugs that are undetectable. Had it not been for a feud between coaches, athletes would still be using THG and we'd be none the wiser. The reality is that a negative test is more likely to mean that the athlete has outsmarted the tester than it is to mean a genuine negative test. The overused defence "My tests are negative" is more of a taunt than it is a valid argument to pacify the defrauded cycling enthusiast. We are in the age where an athlete can (and does) look you in the eye, and say in front of millions of people "I'm clean. I've never tested postitive. Trust me". And when they do test positive, they throw out excuses that can only be described as laughable. Vinokourov reckons his positive test was caused by "blood in his thighs" after an accident. Never mind the fact that the test actually picks up different TYPES of blood. You don't need to be scientist to spot BS from the other side of the world when it's this obvious. So where to for cycling. Since 1996, not a single winner of the Tour has been without suspicion. Riis (1996) recently admitted to doping, Ullrich (1997) has been implicated in the Puerto affair, Pantani (1998) was all banned and exposed for his doping practices. Yet he, like others, have continued to deny that he was ever guilty, despite court documents detailing his hematocrit levels on a state-run doping programme. Jump ahead to 2006, and Floyd Landis tests positive in a situation that is similar to that of Vino - bad day followed by heroic day. He is still fighting that test result, basing a defence on 'dodgy' processess carried out by the testing lab. And then of course, in between, from 1999 to 2005, we have Lance Armstrong, who has carried more rumours and allegations than any other sportsman. The oft-used quote "I've been tested more than any other athlete, and my test results have always been negative" has become something of a mantra for Armstrong, who must surely be relieved to have escaped the sport as it is now. Because if he was riding now, or if the current atmosphere in cycling was present in 1999, he'd have gone the way of Rasmussen by about 2000, and a "7-time champion" would still be a fictitious event. Yet he won 7 tours in a row at a time when all those around where using drugs that improve performance drastically. How much? Just ask Vino. So well done Rabobank, for making a stand. Let's hope the athletes you pay so handsomely discover their moral conscience and the truth continues to come out. Forget Paris, bring on the next doping affair. Vino tests positive: Will the last clean rider please stand up? The most exciting tour in years? In case you have not heard by now, two more riders have been ejected from the tour, which is quickly becoming the most exciting in recent years due to the constant shuffling of the top placings. These ejections come on the back of Vinokourov's positive test and his team's withdrawal from the race. Italian rider Cristian Moreni (Cofidis) tested postive for testosterone after Stage 11 on 19 July. His B Sample has yet to be tested, but the isotope-ratio mass-spectrometer test has been performed on his A Sample, and it confirmed the presence of external testosterone. The Cofidis team has also withdrawn from the tour. Then, some time after the finish Wednesday, team manager Theo de Rooy withdrew Michael Rasmussen, the maillot jaune from the race, allegedly because Rasmussen lied to the Rabobank team about his whereabouts in June when he missed his out-of-competition tests. This leaves it pretty open until the time trial on Saturday, as Evans beat Contador by 1:14 and he Leipheimer by 1:35. In addition, it is a very flat course with one short Category 4 climb, so advantage Evans. More importantly, though, where does this leave us as cycling fans? This is a tough one. While we are glad that the cheaters are getting caught and the UCI is taking a very hard line (finally), as we said in the previous post about Vino this just raises the question about who is and who isn't doping. We would love to give them the benefit of the doubt, but when Vinokourov and his doctors tell us that he tested positive because due to his crash ". . .there was an enormous amount of blood in my thighs, which could have led to my positive test," we feel insulted and taken advantage of. This excuse is even better than Tyler Hamilton's "vanishing twin" hypothesis. We will remain cycling fans and will watch the tour to the finish, our hope elevated that at long last it appears that the UCI is getting tougher and showing no fear when it comes to expelling top riders. Roll on Paris. . . . In keeping with the format of any good sporting website/blog, from time to time we will review books that we feel our audience might find interesting. 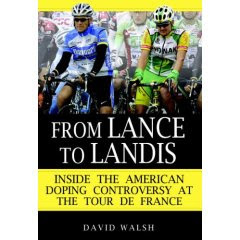 Our first review will be of David Walsh's new book, "From Lance to Landis: Inside the American Doping Controversy at the Tour de France." Although pegged as a "troll" by Lance Armstrong, it should be noted that David Walsh is not a shoddy tabloid journalist but is instead the award-winning chief sports writer with The Sunday Times (London). He is a four-time Irish Sports Writer of the Year recipient, and a three-time UK Sports Writer of the Year recipient. Having said that, "From Lance to Landis" reflects clearly Walsh's journalistic and investigative skills. He conducted many hours of interviews with numerous people, the results of which are many new and different angles on doping in cycling. In addition to the more well-known characters such as Willy Voet and Hein Verbruggen, we are introduced to an entirely new cast in this ongoing drama such as Rene Wetzel, Greg Strock, Dr. Michael Ashenden, and Stephanie Mc Ilvain, among many others. Walsh shows his insight in his analysis of the available evidence, and uses it to help you paint a picture of the current status of the sport on your own. Walsh respects the reader's own intelligence and judgment, and let's you draw your own conclusions based on the evidence he has gathered so carefully. A cycling fan for many years, Walsh cares about the sport and its current condition. This is not an attempt to dirty the sport and ruin its reputation, and as such Walsh seems to realize that only by addressing these concerns will cycling ever move forward and learn from its dark past. For those already well-versed in the doping story, this is not ground-breaking information. However, Walsh provides much new information and he does this with much insight and intelligence. Many of the doping cases of the past several years have been dissected carefully, and the gaps left by the lay press have been filled in by Walsh. Therefore it is a must read for anyone interested in the current "health" of cycling and the peleton. Watch for more book reviews in the future! 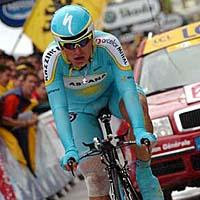 Vino tests positive for blood doping - will the last clean rider please step forward? Well, we did our best. We tried hard to write Tour de France posts without referring to doping or making lame science jokes about doping in some way. But just when we thought we might make it to Paris having seen a great, competitive Tour, which could have been remembered for the ferocious attacks launched by the climbers on the way up to Tignes, the Galibier and Plateau de Beille, it now seems we have a Tour that may again be remembered for the wrong reasons. First Michael Rasmussen, yellow jersey wearer and aspirant Tour champion hits the headlines for failing to give notice of where he was training leading up to the Tour. That in itself is no problem, he has done nothing wrong, but all of a sudden, journalists and riders are debating doping again. Then today, Alexandre Vinokourov, the hero of the race, the poster boy for the human spirit, is reported to test positive for a homologous blood transfusion. He is suspended, his team quits the Tour, and yet again, on the eve of what might have been one of THE great battles of the Tour de France - Contador vs Rasmussen on the Col d'Aubisque - we are rudely reminded of the fact that we must think twice before we celebrate any rider's performance in the Tour, especially the great ones. What a tragedy! For the last three days, commentators Paul Sherwen and Phil Liggett have done nothing but sing Vino’s praises. A true champion. We even dedicated a whole post to Vino’s remarkable Time-Trial performance in Albi on Saturday. A remarkable performance which, it now seems, was powered by blood infusions! Vino, who conjures up images of gladiators, courage, warriors and mental toughness. Vino, who stands for the guts and determination and strength of character. Of all the cyclists in the peloton, he is the one that the sport could least afford to lose to a positive drug test. Because if Vino is doping, then how are we supposed to react to a great ride from a "lesser mortal"? Forgive the dramaticism, but it’s really very sad. Of course, we may be reacting too soon – it wouldn’t be the first time a positive test is announced by a French newspaper, only to be squashed/challenged/defied later on – remember Floyd Landis a year ago? So perhaps we should not pass judgement too soon. In fact, we know we shouldn’t. It would be nice to give him the benefit of the doubt, remaining hopeful that Saturday and yesterday were indeed examples of the depth of performance that is possible given the desire and will to win. But the point is, we now have doubts. Cycling nearly managed to pull itself out of the drug-induced malaise it was in, thanks to Soler Hernandez, Gerdemann, Contador and co. But first Rasmussen and then Vino, and we’ll step back down to join the legions of sceptics, unfortunately. But just as the Tour goes on, so do we. And so over the next few days, we'll keep going on our plan to bring you the physiology of the Tour, and maybe we'll restrain our cynicism until later, when this is all confirmed. Roll on more tour posts! Following the pre-Stage 15 prediction, we will keep the posts coming as thick and fast as the attacks we have seen in Le Tour the past couple of days. In this short post we will get into what it takes to fuel a cyclist through a stage race like Le Tour, and this will serve as a spring board to talk more in the future about exercise metabolism and all its implications. So we all know that the energy demands placed on tour riders are pretty astronomical, but let's think about the basic energy needs of a 75 kg cyclist. His resting metabolic rate, or the amount of energy he requires to sit there the whole day and not do anything, probably clocks in at around 1500-1800 calories, depending on his body mass. That is the amount of energy he requires just to keep his body alive and functioning. Before we delve into energy requirements, it is first important to remember that the cost of moving your body through space is a function of the distance, and not the speed at which you do it. So if you run a mile in 3.5 min or 10 min, it will cost you the same amount of calories. Recall that power is the rate at which work is performed (Work / Time), and so of course, if you run the mile in 3.5 min then you have an incredibly high power output---that is, you burn the same number of calories but in a much shorter time, so that rate at which you burn calories is high. So how many calories does it cost to cycle a 180 km flat stage? 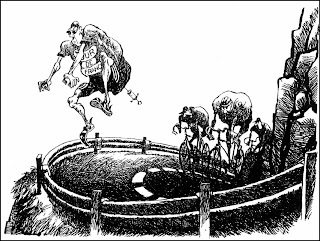 Since cycling is a pretty efficient activity, it costs a 75 kg athlete in the range of 0.3-0.4 calories per km per kg. To be more meaningful, it costs him about 25-30 calories per km. The bottom line here is that a 180 km stage will cost our athlete in the range of 4000-5500 calories, depending on how much pedaling he is actually doing and how much sitting in the bunch he is doing. Our cyclist's total energy expenditure for one day is his resting plus his exercising energy expenditures. Therefore 1500 + 4000 = 5500 calories (we have taken the low end of the range here). "Woo-hoo!" I can hear you saying, "He can eat whatever he wants!" Well, yes, but given the fact that he is on the bike for four or more hours during the day, and feeling pretty tired for another few hours after the stage, plus the "anorexic effect" of exerciswe, plus 8-10 hours of sleep. . .suddenly he has to consume large amounts or calories in not so much time. In fact, if we assume he is "occupied" for up to 16 hours a day with riding, sleeping, and just generally feeling fatigued, he has only about 7-8 h to ingest 5500 calories, which works out to about 700+ calories an hour (for each hour he is free to eat). However, Klaas Westerterp and his colleagues in Maastricht actually measured the energy intake and estimated the energy expenditure in five cyclists in the 1988 Tour de France. Their average intake was almost 6000 calories per day, while their average expenditure was nearly 6100 calories per day---indicating that these cyclists did a remarkable job of (nearly) maintaining energy balance. They accomplished this by ingesting 49% of their energy while riding, which amounted to whopping 94 g of CHO per hour during each stage! This makes it substantially easier to meet energy requirements during the 7-8 h when they are not racing or otherwise occupied. So those are the basic demands and needs for these tour riders, yet this is only an appetizer, if you will excuse the play on words here, becasue what these guys eat and when they eat it both have important implications for their performance and recovery from day to day. Come back for more posts on the optimal diet for a tour cyclist, and in the mean time enjoy the racing! So yesterday, Alexander Vinokourov, featured in the photograph above as being in tears after a dreadful two days in the Alps, where he lost close to 5 minutes on the race contenders after an accident, revived his chances and moved up to 9th in the GC. He's still 5.10 back of Rasmussen, but only 4 minutes behind the other big contenders, and assuming Rasmussen can't steal any more time in the Pyrenees, they are more likely to be threats. So it all makes for a fascinating excursion into the Pyrenees. But we need to get some insight into the science and physiology that might explain how the Kazhak rider managed to comprehensively destroy the best time-triallists in the world, having been so humbled a few days earlier. Vinokourov is a strong time-triallist, sure, but he's not the dominant TT rider in the field. He probably wouldn't even have been the best TT guy in his team! Yet yesterday, he put more than a minute on everyone, doing the sort of ride Indurain and Armstrong used to do. How much energy do I have available? How hot am I now? How hot am I likely to get? How much oxygen do I have available? etc. And it's in response to these questions that it allows riders to speed up, hold the pace, or forces them to slow down. For example, if the rider is not losing heat fast enough, the brain detects a rise in heat storage, which could potentially cause body temperature to rise, and once the body temperature reaches about 40 to 41 Deg, well, that's lights out time! So the brain down-regulates the amount of muscle that the rider can use, and less muscle activity equals less heat production. Unfortunately, it also means going slower, but that's the compromise that allows the rider to finish without over-heating (called hyperthermia). So what does this have to do with Vino? Well, my opinion is that in the Alps, his brain was simply not allowing him to push into "the red", because the sensation of pain and weakness in that knee and the whole body systemic problems after his crash were limiting the brain from doing this. So even though he suffered and had two terrible days in the Alps, his absolute riding intensity was pretty low, certainly by comparision to those ahead of him, especially Valverde, who were attacking like men possessed on the climb to Tignes and the Galibier. When we talk of "absolute", we mean that his efforts were not maximal for what he is capable of - he did suffer, sure, and relatively, he felt like all the other guys, if not worse. But he simply didn't pump out the same wattages, or place the same demand on his physiology, because his brain didn't allow it. The net result of all this is that even though Vino had a bad time, he actually was spared the physiological damage of riding at 90% - his brain kept him at 80%. That 10% is the difference in the TT. As for today, Rasmussen is highly unlikely to be able to attack, because yesterday, he gave it everything to stay in the Yellow Jersey, and that effort will blunt his ability on the Plateau de Beille! And expect Valverde to attack wildly, but for Kloden and Evans to be the big threats to Vino, who I think will probably edge out a sprint at the top! Sudden death in runners - isn't exercise meant to protect the heart? UPDATE: In yesterday's US Olympic Trials, elite runner Ryan Shay collapsed and died at the 5-mile mark. No autopsy yet, but we have looked at this sad event in a series of posts you can read here. We look at Sudden Cardiac Death, and some of the more common causes in more detail. We also devote a post to the career and performances of Ryan Shay. A Heart Attack is caused by a circulation or plumbing problem in the heart,;while Sudden Cardiac Arrest is caused by an electrical problem in the heart. Jim Fixx, Alberto Salazar, Alem Techale, 2 Comrades runners this year. Perhaps you recognize some of these names, others not. But they all have two things in common. First, they suffered heart attacks/sudden cardiac arrests (heart attack from now on!). Second, they are athletes (different levels, sure, but athletes nonetheless), and their heart attacks happened while they were running. Most recently (2 weeks or so ago), Alberto Salazar, winner of the 1994 Comrades Marathon, winner of the 1982 Boston Marathon, three New York Marathons, and former world record holder, suffered a heart attack aged 48 during a coaching session. You can read more about this story here. Salazar recovered, the others were not so lucky. Famously, Jim Fixx, who wrote the book The Complete Book of Running, died at the age of 52 during a training run in 1984. Alem Techale, fiancé of Kenenisa Bekela, collapsed during a training run in 2005. These events tend to be emotive topics, because they shatter the perception that the fit among us are immune to this problem – the world record holder, a man who runs 50 miles a week, having a heart attack! Surely not? So what we at The Science of Sport thought we would do is take a look at the physiology and medicine of sudden death and heart problems during running. This is of course a very complex topic – this post should come with a disclaimer – it can’t possibly cover all the options, but it does present the most common explanations for what we all read about with shock when the ‘ambassadors’ of healthy living are struck down by what we see as a disease of the unit. In the 1970’s, the American Medical Joggers Association (yes, it’s a real name!) published a report in which they claimed that not a single marathon runner had died due to a disease called coronary artery disease – in this disease, the arteries that supply blood to the heart become narrowed by cholesterol deposits inside them, and the heart’s blood supply can be restricted. It’s a common cause of heart attacks. The conclusion made by the AMJA, led by a scientist named Bassler, was that marathon running provided immunity against coronary artery disease and heart attacks. This became known as Bassler’s hypothesis, and it contributed to the “running boom” of the 1970’s. However, by the mid-1980’s, cracks began appearing in the façade. Two deaths during training were reported by scientists from UCT, and so the “protection” theory was questioned. In 1984, data were published showing that 75% of athletes who died during exercise had signs of severe cardiac disease, effectively disproving the Bassler hypothesis. That’s not to say, of course, that regular exercise is not beneficial, because it is. There is a wealth of research that suggests that regular exercise improves heart health. But the net result of all these studies was that while a marathon runner is less likely to develop coronary artery disease, they are not immune. So with that in mind, how often does a heart attack during exercise happen? Without wishing into going into too much detail, studies have looked into this and found that the risk of sudden cardiac death is incredibly low, much lower than it is for the “normal” population. For example, one study in Rhode Island found that there is one death per 7620 runners PER YEAR. That is incredibly small – remember, a “normal”, non-running group of 7620 people has a much higher chance that at least one person will have a heart event per year. Another study found that the risk of death in a group of runners was about 1 in 50 000, or 1/100th that of a non-running population. Those are odds I would certainly want in my favour! So what MIGHT HAVE happened to Salazar? Studies from the 1980's and 1990's have found that virtually all the runners who die suddenly during exercise are suffering from some sort of serious heart disease before their fatal heart attack. There are probably about 30 possibilities, but we’ll focus on one or two. The most common one by far is coronary artery disease, or CAD, which we mentioned earlier. This is where the blood vessels supplying the heart become ‘choked’ due to cholesterol plaques that form over the years. This is the main cause of death in runners older than 35 – the plaques take time to form and eventually completely block off the blood supply to the heart. The heart, of course, can’t function without the blood and the muscle dies as a result. It’s quite logical to see how exercise, if not controlled, will contribute to a heart attack, because the demand from blood and oxygen by the heart is greatly increased, and there’s also more chance of a plaque being dislodged and blocking the vessel completely. This is what happened to Jim Fixx, with the autopsy showing that one coronary artery had 95% blockage, a second 85%, and a third 50%. This, by the way, is also the reason why people with high blood pressure or CAD should not do heavy weight training – the blood pressure rises drastically during weight training and this can cause the plaque to break off, causing a heart attack. So people with high blood pressure or CAD are better off doing cardiovascular type training, where the blood pressure rises far less. In people who are younger than 35, the cause of death is more likely to be what is called a congenital cardiac abnormality. There are loads of these, and then include something called hypertrophic cardiomyopathy (apologies for all the medical terms and lengthy words). This is basically a disease where the heart muscle grows in size (that’s what Hypertrophy means) to the point where the blood supply is not sufficient to meet the demand, and the overgrowth of the muscle interferes with the ability of the heart to contract and relax. In other words, a large muscle needs greater blood supply and this can’t be met. There are reports, for example, of cyclists who increase the size of their hearts through training and eventually reach the point where they cannot supply enough blood to the muscle. So in some people, the size of the heart muscle is simply too large to supply blood to, and the muscle becomes diseased as a result (this is the cardiomyopathy part). In young people, there is also something called familial hypercholesterolemia – as the name might suggest (by the time you finish re-reading it! ), this is a condition where you can inherit (familial = family) high cholesterol levels. So when a young athlete dies, it’s possible that they have the coronary arteries of a much older person, purely as a result of their genes. This is of course also a major factor for older runners – Jim Fixx’s father suffered from two heart attacks, one aged 35 and the second (fatal) one at 42. So his problems were certainly related to heredity. There are of course many other possibilities, include abnormalities in the arteries, and diseases with exotic-sounding names like dysplasia, Marfan’s Syndrome, and myocarditis. Then of course,there are the electrical disturbances, including arrythmias and channelopathies. But this post is technical enough without details on these. So we'll settle on CAD and hypertropy. If there are any specific questions, we’d be happy to attempt to respond, but we’ll leave the technical stuff there! But before we move onto the practical information and message, it’s worth also pointing out that heart attacks can also be caused by exercising with a viral infection. This can cause a virus to infect the heart muscle (myocarditis) or the pericardium (a membrane around the heart – pericarditis). When this happens, the athlete can die even though they are otherwise healthy. So if you have flu symptoms, this is the critical reason why exercise is not recommended. I’ve heard reports that a lot of the elite cyclists in Europe die young because the nature of their sport demands that they often race when carrying a viral infection like flu. Fortunately, most of us are not in that position, so we can take the sensible option and rest! Now, onto the more important stuff – how do you avoid this, and what do you do with this information? A key point is that a lot of people ignore early warning symptoms, literally running into further trouble. The main early warning signs are chest pain, excessive shortness of breath, and abdominal pain. One story, documented in the literature, actually found that a runner did a 64km training run with severe chest pain, which forced him to walk numerous times, before doing the Comrades Marathon. During Comrades, he suffered a fatal heart attack. It’s been reported that about 81% of runners who suffer heart attacks during running had experienced and ignored chest pain or some symptom before “the main event”. So the bottom line – don’t ignore the signs! So where does that leave you as a runner? Assuming you’re a runner, then, you’re in a pretty strong position. But not an invincible one. Research has shown that in those people who have some sort of undetected heart disease, the risk of sudden death during exercise is massively reduced by regular exercise training. However, these people are more likely to have a heart attack while they exercise than while they are at rest. Hopefully that is clear – exercise reduces the overall risk by a factor of almost 100, but if the runner has a condition that will cause a heart attack, there’s a greater chance of it happening while they exercise. So as a regular runner (we hope! ), you can be happy in the fact that you are about 100 times less at risk that your non-running colleagues. But you are not immune and so looking after the health of your heart, which includes checkups and tests, is still important, so that any symptoms of heart disease can be treated early. And should you stop exercising because you MIGHT be at greater risk? Well, no, because the data show that if you do this, and stop training, then your risk goes up massively. So no matter which way you look at it, it’s far better to continue running and training. In fact, if you’re reading this and you may have some sort of coronary artery disease, then you, of all people, would be best off by doing regular exercise, because the beneficial effect is the greatest. “runners are much like ordinary mortals. They can, sad to say, get sick. They can even die”. True, but less often and with reduced risk compared to non-running ‘mortals’, so keep running! Bumper week for South African Sports! As is normally the case in the sporting world, there are too many events to count and always keep tabs on. And when our interests are as wide and deep as ours here at the Science of Sport, sometimes things slip under the radar as we cannot cover all sports all the time. However, we will always recognize South African sporting achievements, and this week was quite something for SA sports. The world championships of sailing (ISAF Worlds) has just wrapped up in Cascais, Portugal. It was a multi-faceted event with different types of boats sailing against only each other, that is, boats competed within their classes. It is a big deal because although each class has its own world champs each year, the ISAF Worlds are held only every four years, so it is kind of the Olympics of sailing where the best of the best compete against one another. South Africa had several entries, and what follows are the details of all of them. In the women's double-handed dinghy class (470's), Dale Rae and Tiffany Baring-Gould competed in what was a very competitive class and fleet. They struggled and finished 60th, but were extremely consistent and cracked the top 25 four times out of the ten races. Mark Sadler and David Rae competed in the men's skiff class (49er, which refers to the surface area of the sails). These are small and extremely fast boats due to their large sail area. This was a super competitive fleet. Sadler and Rae finished 64th out of 81 boats, but the important thing about this team is that they both spent the past four years sailing on South Africa's America's Cup boat Shosholoza, Mark as the skipper and David as the main sail trimmer. These guys had only a couple of months to jump into their new boat and get competitive, and that is a big ask for anyone---even guys like these who are at the top of their game. In the women's keel boat class, the Yngling (I have no idea where they got this name and what it means! 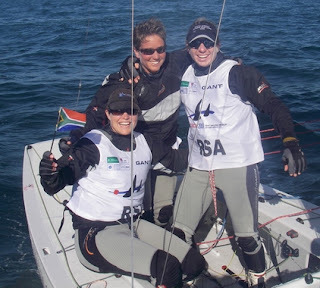 ), Dominique Provoyeur, Penny Alison, and Kim Rew are Team Isigungu (left) and comprised the South African entry. Out of 35 boats these ladies finished 12th, which is pretty impressive, but more importantly this result qualified them for the Beijing Summer games in 2008! This keeps alive a streak of South African sailors who have qualified for the Olympic Games dating back to 1992. You can read all about their team at their website here. Also in sailing accomplishments for South Africans is Gareth Blanckenberg. Gareth won the Laser class regatta at the All African Games (26 July to 4 Aug in Algeria) and in doing so became the reigning African Champion. Gareth previously represented South Africa in the Sydney and Athens Olympic Games. 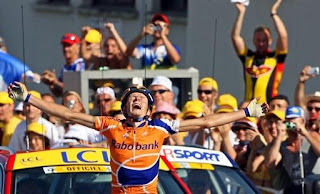 Finally, Robbie Hunter, a South African cyclist on the South African entry Barloworld won Stage 11 in the Tour de France. Barloworld is a wild card entry this year, and they have been proving their merit lately. One of their Colombian riders, Mauricio Soler, won Stage 9 on Tuesday. Hunter consistently has been in the hunt for a stage win, finishing second earlier in the tour and beating Thor Hushovd in the process. The win was the first by a South African in the tour, and places Hunter firmly in the chase for the green jersey as he is just 11 points off Boonen's 160 pts and just ahead of Erik Zabel's 144 points. So there you have it---a quick wrap up of South African sporting achievements. Well done to all these athletes, and best of luck to all of them from us here at the Science of Sport! We did a post on the science analysis of the Tour so far, but steered clear of analysing the fate of the pre-race favourite, Vinokourov. But, what do we make of Vinokourov, and his team-mate Kloden? On Saturday, we did a post that predicted that they would have to hang on in the Alps, limit their losses. This was mainly because of the systemic, 'whole body' response to their accidents, that would leave them feeling weak. Kloden managed, apart from team orders which forced him to wait on the climb up to Tignes (how vital might that minute be in the end?) Vino was not so lucky - he has lost minutes and with it, likely the Tour (I would say he's lost the Tour, but we all remember Landis last year, right?). left him unable to fight off an "opportunistic infection", which all the cyclists are susceptible to. The demands on 5 hours of racing a day leave the immune system in a very compromised position, particularly if the energy intake (diet) is not optimal. So it's all related in the end, and bad luck for the Kazhak rider. I'd still pick Vino for a stage win, like he claimed in 2005 after his overall chances had been accounted for. But perhaps next year the unlucky rider will be back for the GC. But then again, there's always memories of last year...! In this short post we will get into what it takes to fuel a cyclist through a stage race like Le Tour, and this will serve as a spring board to talk more in the future about exercise metabolism and all its implications. So we all know that the energy demands placed on tour riders are pretty astronomical, but let's think about the basic energy needs of a 75 kg cyclist. His resting metabolic rate, or the amount of energy he requires to sit there the whole day and not do anything, probably clocks in at around 1500-1800 calories, depending on his body mass. That is the amount of energy he requires just to keep his body alive and functioning. So how many calories does it cost to cycle a 180 km flat stage? Since cycling is a pretty efficient activity, it costs a 75 kg athlete in the range of 0.3-0.4 calories per km per kg. To be more meaningful, it costs him about 25-30 calories per km. The bottom line here is that a 180 km stage will cost our athlete in the range of 4000-5500 calories, depending on how much pedaling he is actually doing and how much sitting in the bunch he is doing. Our cyclist's total energy expenditure for one day is his resting plus his exercising energy expenditures. Therefore 1500 + 4000 = 5500 calories (we have taken the low end of the range here). "Woo-hoo!" I can hear you saying, "He can eat whatever he wants!" Well, yes, but given the fact that he is on the bike for four or more hours during the day, and feeling pretty tired for another few hours after the stage, plus the "anorexic effect" of exerciswe, plus 8-10 hours of sleep. . .suddenly he has to consume large amounts or calories in not so much time. In fact, if we assume he is "occupied" for up to 16 hours a day with riding, sleeping, and just generally feeling fatigued, he has only about 7-8 h to ingest 5500 calories, which works out to about 700+ calories an hour (for each hour he is free to eat). So those are the basic demands and needs for these tour riders, yet this is only an appetizer, if you will excuse the play on words here, becasue what these guys eat and when they eat it both have important implications for their performance and recovery from day to day. Come back for more posts on the optimal diet for a tour cyclist, and in the mean time enjoy the racing! Ok, so it's not entirely mid-way, but I thought that with the current 'lull' in proceedings between the Alps, which ended yesterday, and the first individual time-trial and Pyrenees coming up on the weekend, it would be a good chance to cast a 'physiological' eye over the race and give some impressions. It's been a frantic few days of racing. It's quite evident that we are watching one of the most wide-open Tours in recent times. The same was said about last year's race, but this is something else. On Saturday, Sunday and yesterday, all the Alps stages, at least four or five different riders all launched multiple attacks - gone are the days of one definitive attack from an Armstrong or Pantani and the group was split - this is real racing. It's interesting to speculate on the physiological basis for this. A big factor is the absence of a strong, dominant team, riding hard tempo to the bottom of the climbs. In the past, this has allowed Armstrong to put his opponents into difficulty before even launching the attack - 'softening them up', so to speak. This year, perhaps the absence of that hard pace leading into the climbs has allowed a lot more riders into the contest. The result is that a rider who attacks, with a surge of say 700W for 45 seconds, is not able to do quite enough to drop riders who bridge gaps a little too quickly. And then once they are all together, the stronger riders are not quite able to overcome the benefit of drafting for riders behind. The only exception was Rasmussen, but he was allowed to go by the peloton, and it will be interesting to see whether his attacks are able to split the group once we are in the Pyrenees. But at the moment, the attacks are threatening, but never quite cracking riders. This means that perhaps all the riders are within 5% of one another in terms of power output, and so the small difference made by wind resistance on the climbs is enough to keep weaker riders in a group, or conversely, to prevent stronger ones from quite escaping. Rasmussen's effort the other day was special - he rode a solo mountain ride and then recovered enough to mark attacks over the Galibier, which in my opinion was an even better ride. It will be great to see if he does this in the Pyrenees. Unfortunately for him, his time-trial ability may undermine his efforts. This of course means he will have to attack in the Pyrenees and then we'll see whether he's the best man this year. The other fascinating thing is to observe whether all the "infighting" that has gone on between the likes of Contador, Mayo, Valverde, Moreau and Evans comes back to haunt them. They have expended a lot of energy without much reward over one another. One sure thing is cycling, as in physiology, is that there is always "a bill to pay". And the attacking that was going on during the climb up to Tignes and on the Galibier will certainly have a cost. And the silent followers - Saster, Leipheimer and Kloden - who have been sitting in and bridging gaps more gradually, may benefit in the third week. Physiologically, the effort that it takes to accelerate and attack is enormous - it places a real demand on the sympathetic nervous system and this stress response is ultimately what hinders the cyclist as the Tour goes on. It's all about what in science is called the HPA axis - hypothalamic Pituitary Adrenal axis (we'll stick with HPA then!). So these guys, who attacked one another relentlessly may well pay for it on the Plateau de Beille, or possibly even during the TT the day before. And the guys who've been steady and consistent are likely to be stronger in week 3, and that makes for interesting racing! So that's our halfway assessment of the Tour. In the coming days, we'll have a more in-depth look at the physiology of the Tour, including a look at how much energy these guys go through and what they have to eat. We'll also do post that explains just what sort of power outputs they need to be competitive and also what happens to their bodies during the race. Until then, enjoy the clash in the Pyrenees! The first study - the IAAF find "bouncing locomotion at lower metabolic cost"
The article below was written in 2008, but has been "dated" by the latest publications by Weyand and further debate on the issue. So this weekend saw the much anticipated and much debated debut of Oscar Pistorius, South African Paralympic runner, in the 400m events at the Rome Golden Gala and a Sheffield Grand Prix. And unfortunately, the weather intervened in Sheffield and we perhaps did not see the best of the runner, making interpretation of the IAAF data difficult. But there was Rome, and a time good enough in the B-race to gain second place, finishing in 46.90, which is about half a second off his PB. And the IAAF did analyse this race, with some fascinating results. Some of these results were published in the Sunday papers, and members of the IAAF have been giving interviews and explaining their results. In one of the local papers down here in SA, they actually reported some of the results from the IAAF analysis in Rome, and so using those facts, and together with some other really interesting data from other 400 m races, thought it might be interesting to do a post to investigate the theories. Note that this is not all the research that will be done, and nor is it even a comprehensive discussion on the small part that has been done, but I thought it would be interesting to look at the factors that need to be considered, so here is my interpretation. On Friday night, while I was watching the Rome event on TV, it occurred to me that the 400 m events are all about survival. Because the race is really won or lost in the final straight. The athletes seem to seize up, and get incredibly tight and slow down progressively. And science has shown us that athletes get slower and slower as the race progresses. This is even the case for the world record of Michael Johnson, and for the winning performances of every single 400 m Olympic champion. Fast start, slower finish, and the winner is the one who slows down the least. Why does this happen? Well, it's complicated, but the basic reason is that fatigue impairs the ability of the muscle to store and release energy and to provide forward propulsion. Remember, an able-bodied runner has to invest energy twice - once to store the energy and again to release it. These muscle contractions cause changes in the muscle, they have a cost and this cost is ultimately what causes the athlete to slow down - whether this is muscular or nervous system is not really relevant to this discussion. But what happens if part of the leg never gets tired? If there’s no muscle to reduce activation levels of? Because then the athlete is benefiting from forward propulsion without the possibility of fatigue. If this is true, then the prediction is that the that an athlete running on Cheetahs will start and finish at much more comparable speed than anyone else. What you will see immediately is that the runners slow down progressively over the course of the race. This group even includes a world record from Michael Johnson, who ran 43.18s and was no different to the other guys. In the meeting in Rome the other night, the winner of the A-race, LaShawn Merrit, ran the first 200m in 21.2 and the second 200m in 23.3 secs. So what we see right away is that there is ALWAYS about a 2-second difference between the first and second half of the race - the first 200m is 2 seconds faster than the second 200m. So now you take a look at a graph below, that shows the difference between the first and second half of the race for 16 atheltes - men and women's finallists at the World Champs in 1999. What I have done here is to subtract the time for the second half from the time for the first half. Here, if the athlete has run the first half faster (as they always do), then the value will be negative. Many of you are no doubt thinking sure, but his slow start, a problem which has been acknowledged, explains why his first half is slow. The start probably costs him about 1 second though, so you can move this red block down by about 1 second, and you have a difference of +0.5 secs, which is still a major one considering that NO ONE IN HISTORY has run a decent 400m race with this pattern. So the next question is whether this is because of a slow start or a fast finish, and that requires further analysis. However, in the interest of allowing the IAAF to do their work, it would not be proper to publish those results until there is at least permission, so unfortunately, we'll have to speculate a little bit until a later stage. What the data do show is that there may be a massive energy saving in the last part of the race, as has been described. If the prosthetics were less energy efficient, this would not be possible - if anything he'd slow progressively as the distance increased. Fact is that at the very worst, he has maintained speed for longer, sped up more, and slowed down less than any other runner. And the second half is faster than most runners in history as a result, even when running 44 seconds or faster. In fact, the only second half faster than this out of the other 9 atheltes analysed was Johnson when he broke the world record - he ran the second 200 m interval in 21.96 secs. So what does this mean? Well, it's not proving anything, but it's strongly suggestive of some sort of second half benefit, because it's physiologically impossible to run these sorts of splits. I will grant that it also shows that the slow start is a significant disadvantage, but there has never really been a question of this. The second half, however, is in-line with predictions made by the theoretical arguments and models for his performances. There is no doubt more data, even more interesting, but I guess that this will have to wait until the research is completed and then released to the media. But the data they have gathered so far, in my opinion, are highly suggestive of some sort of effect, particularly in the second half of the race. What is left for the IAAF to do is decide on the next questions they need to evaluate, and while I again can't go into the details, they have some very intriguing information to pursue. We'll try to keep you posted, and as soon as it all comes out, we'll definitely give the full scientific run-down on whether or not the limbs might be advantageous, and why (or why not). Over the coming weeks, as the IAAF make the results available, this article will be updated to cover all the findings. Oscar Pistorius: Should he be allowed to run? About three years ago, I was attending a Sports Medicine and Science Conference in Nashville, Tennessee, and had dinner with a fairly large group, among whom was a certain Amby Burfoot. Of course, I had heard of Amby, since he won the Boston Marathon in 1968. He then went on to become the Executive Editor of Runner's World USA, which was the background to our meeting in Nashville. Amby has always been a 'cutting edge' writer, and keen to find out the latest research and science, as applied to running. So we had dinner that night, and he spoke mostly to a colleague about her research on fluid replacement and a condition called hyponatremia, which develops if you drink too much water or sports drink (we'll do a post on that some day). But to show you the small world of running and especially science in running, Amby has just given the Science of Sport blog a nice reference in an online "column" that he runs, called Peak Performance. He seems to scour the world of research and come up with interesting articles that runners might find useful, and has referenced our post on Ethiopian runners. So a big thank you to Amby (visit again!) and you can check out his site here. I'm probably going to discredit our own site, but he really does an amazing job of finding all the great science and research, almost every day. So it's well worth a look! The article below was written in 2007, but has been "dated" by the latest publications by Weyand and further debate on the issue. So over the last month or so, we've had quite a big response to some articles written about Paralympic sprinter Oscar Pistorius. He is bidding to be allowed to run in the Beijing Olympics in 2008 for able-bodied athletes. We've carried a series of articles looking at the scientific merits of the case - there is a possibility that the Cheetah prosthetic limb gives him an advantage, and we wanted to look at the possible basis for this. So last night, I was interviewed on an SABC show on the topic. It wasn't too bad, but I certainly felt that not all the cards were laid on the table. My perception of the media and this story so far is that it is actively being moved away from the science at every opportunity. And so hostile and aggressive responses are initiated every time anyone suggests that it may in fact be unfair to allow Pistorius to run. So what I realised last night is that no one is talking here. Science is saying one thing, but Pistorius is not directly addressing these concerns. Instead, he is actively engaging in a "smokescreens and mirrors" campaign to move the focus away from the science and onto the human element (which, by the way, is remarkable, no argument there). So what I then realised is that NO ONE has yet attempted to evaluate the evidence, both from the IAAF side and from the Pistorius side. So below is my attempt at this - it's a long article, I must warn you, but I do think it's complete and these points need to be heard. Thanks for reading! The following four key issues are what I would consider important to the argument on Oscar Pistorius’ desire to compete in the Olympic Games in 2008. I really do believe that each is critical to the argument and would respectfully suggest that no article is complete without sufficiently mentioning each one. Before even beginning to discuss the science of running on the prosthetic limbs, you have to clarify people’s incentives. It is critical that anyone who expresses an “educated” or scientifically formulated opinion on the limbs and their possible performance enhancing effects or lack thereof is understood in terms of their interests in the affair. We must remember that science and commerce/business are very uneasy bedfellows, and so the incentive gap between the search for truth and the desire for an outcome (in this case, competition in the Olympics) must be acknowledged as a key driver of how we interpret information that we have at our disposal. If anyone says that the limbs “definitely do not improve performance”, or confidently asserts that they are passive is lying. And what you will find is that this person has a reason, usually financial, to say so. Thus, the coach, the athlete, the sponsors, and anyone else with a vested interest in Pistorius must first clarify their position before expressing their “scientific” opinion. Again, science and commerce are uneasy bedfellows, and the perverse incentive created by the commercial pull is a bias that must be acknowledged. The IAAF, as the custodian of world athletics, must be cautious in how it approaches this particular situation. It is in a very difficult situation, but I must stress that I don’t believe that it will make a decision that is based on discrimination or bias in any way. We must try to return to the root question, and the issue here is not the discrimination of the IAAF vs. one person. An unfortunate development over the last few weeks has been what I can only describe as a very hostile and aggressive response to the IAAF (and to me) by those supporting the bid to run at the Olympics. I read recently that Pistorius had labelled the IAAF as “pathetic” and “discriminatory” and suggested that they “wake up”. These statements are inflammatory, and I would hope and encourage the whole group, from both sides, in fact, to avoid such personal inflammatory statements. I have actually taken heat in the last few weeks as well, and for no reason other than people are interpreting this situation as personal and discriminatory, when it is not. The only issue is the credibility of the sport. One has to realise that the IAAF must act now based on the possibility that in the future, the introduction of technology into the sport will be impossible to control. The possible implications of the technology are discussed below in Section 4, but briefly, the IAAF risk opening Pandora’s Box of technology in sport unless it can first be shown that the limbs do not confer an advantage to performance. There are perhaps three key arguments for why the limbs would provide an advantage. What I will do is summarize each of these three arguments below, and this will be followed by my response to the arguments that have thus far been put forward by Oscar Pistorius and his team. I feel that it is critical to the issue that we discuss these theoretical concerns. To date, not a single one of the three main points I raise has been addressed by anyone. Rather, they are simply avoided and the focus is deliberately moved away from the science. So what I propose to do in the following pages is the first complete discussion and debate of the issues – I will first present why I believe the limbs confer an advantage and will then evaluate the counter-arguments, according to Pistorius. This statement is effectively saying that the prosthetic limb is able to take the forces that are generated DURING LANDING, store them and then translate this into FORWARD movement. In effect, the limb is able to propel the athlete forward. Now, a human limb is similar in respect to being able to store energy. However, there are two critical differences between the human limb and the Cheetah Prosthesis. Firstly, the human limb is unable to translate the energy into FORWARD MOTION. The Cheetahs, I gather can do this because they have their unique shape. A human limb cannot take a force in one direction and convert it to another without requiring muscle contraction. The human limb is not able to return energy PASSIVELY. In otherwords, if you jump off a box and land on the floor, you do not bounce up, and almost all the energy that might have been stored is lost. This means that if you want to use that energy, a human limb must ACTIVELY contract. There are many studies that have shown that if a landing phase is followed by an active contraction, then at most 70% of the energy can be recovered. Some studies have found energy return of only 30%, much less than the Cheetahs, and this is ACTIVE return. The point is that this recovery of energy is ACTIVE – it requires muscle contraction and therefore requires energy. Pistorius does not require energy, and so the metabolic cost of running will be lower and he has a potentially enormous advantage as a result. The implication of this physiological reality is that the energy cost of running may be reduced. During running, it is factors related to metabolism that are responsible for the fatigue experienced by athletes. These, and the oxygen demand from the muscles, will be reduced in Oscar Pistorius. This is, until proven otherwise, a clear advantage. At its core, sprinting is about accelerating mass. In otherwords, the athlete uses muscle, which applies force to a mass to cause it to accelerate. It is well known in coaching and in science, that two factors can influence how much acceleration can be achieved. The first is the force that is applied by the muscles. This is the reason that the sprinters you see on television are so extremely well-built and defined – a great deal of power is required to sprint. The second factor is mass. A smaller mass is easier to accelerate. Now an athlete’s lower limb would usually weight between 5 and 8 kg. In Pistorius’ case, the limb is massively reduced by ultralight carbon fiber blades that weigh no more than 1kg. This means that he is saving approximately 6 kg on each leg when he runs. I would challenge anyone to go out and run with an extra 6 kg tied to each leg and see how far they get. The reduction in mass is thus a massive advantage. Now, the counter-argument to this is that Oscar does not have calf muscles to assist with this force generation. This is of course true, and so the scientific response is to look at just HOW MUCH DO CALF MUSCLES ACTUALLY CONTRIBUTE TO PROPULSION DURING RUNNING? And the answer is surprisingly little. In fact, studies have estimated that during walking, only 6% of the total energy comes from the Achilles tendon and calf, and during hopping, it rises to about 16%. Therefore, for sprinting, we might assume it is between 10 and 15%. This is a remarkably small amount, when you consider that the reduction in mass is probably 90%. So he is losing maybe 15% of his ability to push forward, but he also loses 90% of the weight of the lower limb, and about 40% of the total weight of the limb. In Pistorius’ case, then, the main muscles that are working during running are the hip flexors – these are the muscles that drive the knee forward. These muscles are without any doubt doing less work considering the greatly reduced mass that they are responsible for accelerating. The spring effect of the limbs, which was discussed previously. I have already commented on this, and the fact remains that the limbs are designed specifically to PASSIVELY return energy to the runner. An able-bodied athlete must ACTIVELY contract the muscle to capture and use this energy. The fact that the prosthetics are designed to simulate the ability of the runner to run on his toes. In sprinting, runners usually land on the ball of the foot, but the problem is that the ankle, which is a hinge joint, “Collapses” and causes a great deal of inefficiency. If the ankle could be locked in place, it would increase stride length and mechanical efficiency substantially. Now Pistorius has this advantage automatically. This is, in fact, the reason that he is able to beat the single-leg amputees so easily – they have to have one leg shorter than the other, because otherwise, their natural leg would collapse every stride, the prosthetic would not, and they would rock from one side to the other substantially more than an athlete does anyway. Therefore, the opportunity to design a limb that maximizes stride length is a potential advantage. I am not suggesting that he has longer legs than he would otherwise have had. However, the fact that he is pushed onto the “ball of the foot” artificially increases the stride length and efficiency, providing an advantage. Evaluation of the counter-arguments. What claims are made by Pistorius? Having described the evidence that I believe is suggestive of an advantage, we now need to consider the opposing view, namely that the legs do not confer an advantage. These opposing views are drawn from articles published on the internet and in newspapers in the last 3 months. The claim has been made that the Cheetahs are in fact less efficient than a normal human limb. A scientist has made the claim that the human Achilles Tendon is able to release 240% of the energy it stores. This claim is patently incorrect – I have quoted studies that have shown that the Achilles tendon can only return between 30% and 75% of the energy it stores. Further, the human calf and tendon cannot take force in one direction and convert it to another – the prosthetic limb can do this, as I explained. Finally, and this is also explained in detail above, the human limb does not return most of the energy passively – it requires active muscle contraction. The assertion then, that a human limb is more efficient is not correct. My feeling is that these claims are made by scientists who will say whatever is required as soon as the price is right. Obviously I don't have a build-up of lactic acid in the legs, but I have the same ratio of blood per muscles in my body as everyone else, and the only way you'd get less lactic acid would be if that ratio was less. The IAAF haven't spoken to me and they haven't spoken to my physios, who work on my back every day because it's screwed up with so much lactic acid in it. I have to ice my back every day so I can train the next day because of the lactic acid build-up. Firstly, it must be pointed out that lactic acid is not responsible for his back pain to begin with – lactic acid is gone from the body within the first 30 minutes after stopping exercise, and so back pain felt even one hour later is NOT caused by lactic acid. This is a theory that exercise science has debunked in the last ten years, and is thus out-dated. Now, the next consideration relates back to the two points I raised previously. Firstly, the fact that the Cheetahs return energy passively rather than actively means that the metabolic cost of running is reduced. Second, the main muscles of locomotion are doing less work to accelerate a lighter mass during sprinting with Cheetahs. As a result, the reason for the lower lactic acid levels is not the ratio of blood to muscle to begin with – it’s the work being done by the muscle that is reduced. The base assumption is thus incorrect. This particular argument has been made on numerous occasions. The claim, essentially, is that the limbs have been around for 14 years, but no one has run these times, so it must be Pistorius who is responsible and not the limbs. First of all, the Cheetahs were only developed in 1996, and Ossur bought the design in 2000, so the feet as we see them today are only about 6 years old. Of course, prosthetic limbs have been around longer, but if the whole argument is that technology is advancing, then old technology is not valid. In fact, if you think about it, this whole “best athlete in history” claim actually supports the theory that the legs improve performance – if it was natural athletic ability, then it is more likely that someone in the last twenty years would have been close to these performance times. Instead we have a situation where an athlete is only emerging now, which happens to co-incide with what is arguably the biggest boom in technology that the world has ever known – we are in the age of technology. The company Ossur is now making limbs with intelligent, electronic knees, which improve stability massively. It does not seem to me to be too big a jump to assume that limbs are improving at the same time. So the claim that the SAME LIMBS have been around for 14 years is patently incorrect. Further, Pistorius’ own coach, father and himself have been quoted in the media talking about how they were able to run faster when they received new limbs. So it is the growth of technology that may explain why Pistorius is the only runner to run these times. The athlete must be wealthy. Even basic prosthetic limbs are too costly for a lot of amputees to afford. As a result, the vast majority of potential runners cannot afford to compete on an even-playing field. The beauty of athletics is that it allows all athletes, regardless of income and wealth, to compete. This is why the Kenyans, who may be impoverished, can race equally against Chinese, Australian, Swedish and American runners. In the category of double amputees, this is impossible. I am informed that the Cheetahs cost about $18 000 EACH. Few athletes can afford this. The athlete must have physical therapy from a young age. Learning to walk on prosthetics is a huge advantage, and so too is the therapy from a young age, which enables the person to function relatively normally and gain the necessary balance to perform sporting activities. This is not available to all children who have amputations. A final consideration is that the amputation must be below the knee, because the loss of the knee joint and the stability and power it provides would be impossible to overcome. Needless to say, Pistorius received all four of these essential requirements. And while his achievement is no less remarkable, he finds himself in the ONLY possible situation to be able to run – it is a very small percentage of people who fall in this category to begin with. This, combined with the advances of technology are the explanations why we are seeing this situation now. At this stage, it is important to identify the single factor that is without doubt a disadvantage to Pistorius. And here, I have no hesitation in saying that Pistorius is at a disadvantage and that is from the starting blocks. Because of the double amputation, and the fact that Pistorius is running on legs that have a very small contact area with the ground, his balance from the blocks is compromised. It is for this reason that he starts so slowly and then has to catch up distance on his rivals. However, in the 400 m event this disadvantage is greatly reduced, and is almost minimized, and that is the reason why I suggested in an interview after the 2004 Athens Paralympics that he should consider stepping up to the 400 m event. I’m sure that this was the plan anyway, but it made sense, because the start in the 100 m and 200 m events are so crucial. In the 400 m event, this is less important and the result is that his disadvantage is reduced. I dare say that the 800 m event is even more likely to be a strong one, particularly since the metabolic theory seems so obviously correct – no peripheral metabolites regulating performance will result in a massive advantage, perhaps even greater than in the 400 m – you read it here first! I think that it is critical for people to realise that the IAAF, as custodian of the sport, must make a decision that stands up to scrutiny in ten years’ time. Therefore, it must be emphasized that this is not an issue about IAAF vs Pistorius, or about Tucker vs Pistorius. At the heart of the issue is the introduction of technology to the sport, and the future consequences of this decision. I would appeal to everyone to try to consider the situation from the perspective of the IAAF. It is not a question of fear or embarrassment that a Paralympic athlete can compete with the able-bodied athletes. They are not “scared” of the reality. Their concern is how their decision now will impact on the future of the sport, regarding technology. And the key here is that technology makes it very difficult to regulate how improvements in sport are achieved. This is analogous to the situation in F1, where advances in technology made cars faster and faster, until the point was reached where driver skill was becoming increasingly minor to the performance of a car. Now, in athletics, we may be faced with a situation where a 0.5 second improvement can be achieved through the slight manipulation of equipment, and this is not acceptable, since it means that training is difficult to quantify. In fact, there is little evidence that over the last 3 years, Pistorius’ improvements in the 400 m event have been the result of anything other than technological advancements – articles on the matter have mentioned how Ossur and Pistorius have worked together over the last few years to improve on the technology. In a letter to a website, Pistorius’ prosthetist has described how they have to align the limbs for best results, how they have to set them correctly, ensure that they are strong enough, manipulate the elasticity, work on the aerodynamics etc. This to me suggests very clearly that what happens OFF THE TRACK, in terms of the engineering and preparation, plays a vital role in the on-track performance. Now, we have a situation where an athlete has improved and we cannot account for the ORIGINS of this improvement. Was it due to training? Or was it due to improved aerodynamics? The mere fact that the athlete and the scientific and engineering team work so closely to develop prototypes is an indication that the limb design does play a role in performance and that’s not a situation that the IAAF can afford to create. We are in danger of opening Pandora’s Box and introducing a new realm of performance enhancers to the sport. All of this invites the obvious study that needs to be done. I would anticipate that many people, notably those who are pro-Pistorius, will be claiming that aerodynamic advantages and technological advantages are there for all to benefit from. So what I would suggest is that Pistorius must run in limbs that were used in the 1996 Paralympic Games. And Jeremy Wariner must run in shoes and clothing that were worn in the 1996 Olympic Games (both in Atlanta). And then we will immediately see whether the change in technology affects one athlete more than the other. My suspicion is that Wariner will run almost exactly the same time in the shoes from 1996 as he can in the shoes from 2007. What will happen with Pistorius? Because if he can’t run the same time, then we have the answer – the improvements are technological. And if the improvements are technological, then allowing him to run at the Olympic Games will present the whole world with an opportunity to benefit from the SAME technology. Because you cannot outlaw technology for some athletes, but not for others. And before you realise it, Nike, Adidas, Mizuno and Reebok will all be designing shoes that have the same spring properties as the Cheetahs. It will have opened Pandora’s Box, and my prediction is that a sub-40 second 400 m will be achieved within five years. Does this sound like a passive device? Do human limbs bounce of their accord? Does it sound to you as though these Cheetahs do not play an active role in assisting bounce and movement? And of course, the big challenge is to control them. That’s not easy, and that’s what Pistorius does best. But then he learned to walk on them, it’s not that unusual. Gymnasts are able to balance on a 5cm wide beam because they practice for hours a day. I could not imagine being able to do that either. But it’s possible. And it’s possible that in five year’s time, if the IAAF let this through, that a 26-year old American sprinter will run the 400 m event in 39.5 seconds, because the “shoes” he wears make it “difficult to move slowly” and “bounce of their own accord”.